ATLANTA (April 7, 2014) – It has been seven years in the making and Chick-fil-A® is ready to debut a new lineup of grilled chicken entrees that will give the chain one of the most nutritious and expansive grilled menus across the quick-service industry. 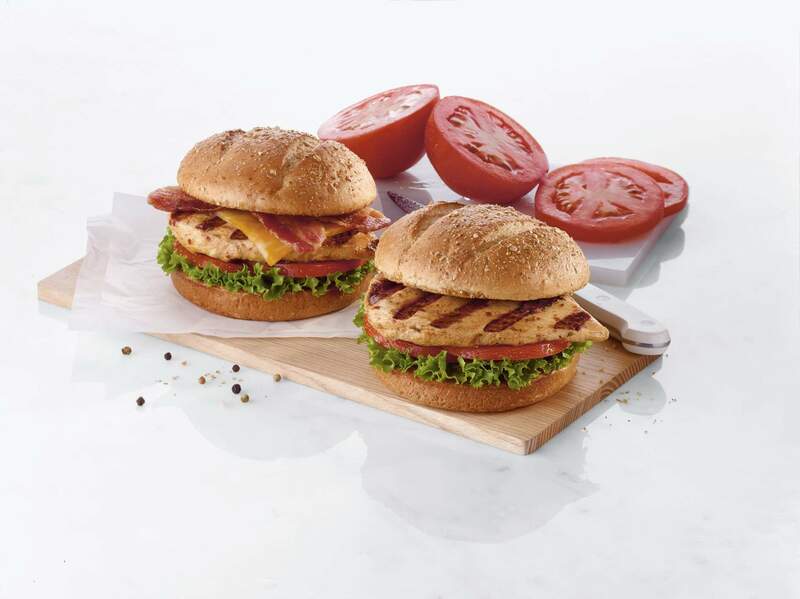 On April 14, the Atlanta-based restaurant chain will introduce three new entrees – the Chick-fil-A® Grilled Chicken Sandwich, Chick-fil-A® Grilled Chicken Club Sandwich and Chick-fil-A® Grilled Nuggets – in an ongoing effort to provide more flavorful and “craveable” grilled options for its nutrition-minded customers. Chick-fil-A’s new recipe features an unmatched backyard grilled taste. Each grilled chicken breast is freshly marinated with a blend of sea salt, lemon, garlic and savory herbs, and cooked on a state-of-the-art, proprietary grill developed by Chick-fil-A. The technique creates a tender, juicy filet with just the right amount of smoky flavor. To make this menu enhancement possible, Chick-fil-A invested seven years of testing and more than $50 million to reinvent its grilled chicken recipe. The largest portion of the investment came as the company worked with Garland Grills for more than 10 years to create a proprietary grill. This grill sears chicken perfectly on cast-iron grates like it was cooked on a backyard grill, only faster. Chick-fil-A Grilled Chicken Sandwich: The Grilled Chicken Sandwich is a boneless breast of chicken, marinated with a special blend of seasonings and grilled for a tender and juicy backyard-grilled taste. It is served on a new toasted, multigrain bun with green leaf lettuce and tomato and served with a side of Honey Roasted BBQ Sauce. It is priced starting at $4.29 with just 320 calories and 5 grams of fat, making it one of the most nutritious grilled entrees in the quick-service industry. Chick-fil-A Grilled Chicken Club Sandwich: Building on the improvements of the Grilled Chicken Sandwich, the Club adds a kick of flavor with Colby-Jack Cheese and Applewood smoked bacon. It is priced starting at $5.49 and has 460 calories and 14 grams of fat. Chick-fil-A Grilled Nuggets: Chick-fil-A Grilled Nuggets, which were first introduced in 2012 as a Kid’s Meal entrée, are bite-sized pieces of pure boneless breast of chicken that are great as a meal or a snack. Customers can order Grilled Nuggets in 8-count (160 calories, 3.5 fat grams) or 12-count (230 calories, 5 fat grams) with their choice of dipping sauce. Grilled Nuggets are made without gluten-containing ingredients and are free of trans fats, with prices starting at $3.79 and $5.59, respectively. Chick-fil-A’s new grilled chicken recipe also enhances the chain’s line of other grilled chicken entrees, including the Chick-fil-A® Grilled Market Salad, Grilled Chicken Cool Wrap® and Chick-fil-A® Chicken Salad Sandwich. On Feb. 11, Chick-fil-A announced that it will serve chicken raised without antibiotics in all its restaurants nationwide within five years. The move marked the first time a quick service restaurant has committed to a 100 percent “raised without antibiotics” standard for poultry. In late 2013, the company removed yellow dye from its chicken soup, and is testing the removal of high fructose corn syrup from all dressings and sauces, artificial ingredients from its bun, and TBHQ from its peanut oil. Also in 2013, Chick-fil-A overhauled its salad line by introducing three new premium salads, as well as a new wrap, touting locally sourced greens and premium fruits and vegetables. Chick-fil-A is actively working to reduce sodium across its menu, including a 25 percent sodium reduction in breads and 10 percent sodium reduction in dressings and sauces. Atlanta-based Chick-fil-A, Inc. is a family owned and privately held restaurant company dedicated to serving the communities in which its restaurants operate. Credited with inventing the chicken sandwich, Chick-fil-A serves nutritious, freshly prepared food in 1,800-plus restaurants in 39 states and Washington, D.C.